I was contacted to provide a portfolio for Photography Corner, a photography website. They do a regular portfolio section of customers of SmugMug and the people from Smugmug send them over to our website. You can see the result here. The people at Smugmug asked us to provide them with a portfolio of images to show off their new Smugmungous theme. This new theme stretches across the whole monitor and looks especially stunning on large monitors. They used the images in media events and on their website. Check out the smugmungous images here. In September/October of 2007 Julie and I went to Indonesia on a long trip through the Banda Sea. We visited some very remote islands, some of which have a very notorious history. Especially the Banda Islands themselves were fascinating. These islands are known as the spice islands, and many sea battles were fought over its riches in the 16/17/18th century. I wrote a 4 page story about the trip which can be read in Duiken Magazine, and will be available as a pdf in a few weeks with this article. What is even cooler is that Julie got the cover of the January issue with a nice image of 2 boys coming to pose underwater. Julie has the cover of Scuba Diver Australasia for issue 4 of 2007. It’s an image of a kid in Indonesia playing with us under water. Julie also has a portfolio in the same issue. 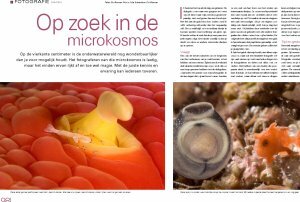 Cor has written another article for Duiken Magazine, this time about searching for macro critters. We have become quite adept at finding small macro life, which came in handy on our latest trip to Komodo where we found lots of undescribed species. The article shows some simple guidelines you can follow to improve your chances of finding small macro life. You can read the article on our articles page. The februari issue of Duiken Magazine has an article written by Cor about Digital Asset Manegement. As digital photographers have more and more images, some form of management is a must if you want to be able to find a needle in the haystack. You can read the article on our PDF article page. All content copyright Cor Bosman/Julie Edwards | Page loaded in 1.495 seconds.